The World’s fastest 2.4GHz telemetry transmitter! Discover race feeling like the pros! 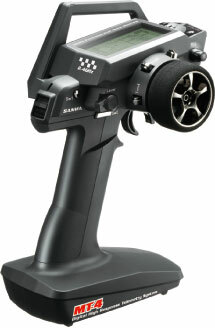 The Sanwa MT-4 is equipped with super fast telemetry and the new 2.4GHz S-Link FH4T system (FH4T = F.H.S.S.-4 telemetry). Once again, Sanwa is unbeatable compared to its competitors. Super fast response, highest transmission security and rapid telemetry data flow make the Sanwa MT-4 the reference product on the market. Produktet blev oprettet onsdag 30 januar, 2013.